intertwined with education on our local wildlife and ecology . and bring your paints on a 'Plein Air' Art Hike. trails in Kings Canyon National Park as a setting for our many Outings. Christine begins making art with new students by teaching them the basic Elements & principles of design. The principles of art represent how the artist uses the elements of art to create an effect and to help convey the artist's intent. We will use both drawing and painting materials to experiment with and develop our knowledge of design. 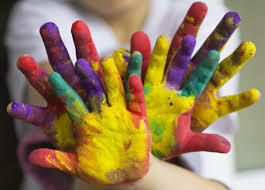 young children can cultivate an understanding of concepts in art, through simple method,practice, and artful play. It's also never too late to begin! many adults have put art behind them, feeling that they lack talent, when all they really need to begin is a basic knowledge of concepts that help form art. Students will be given projects, and exercises to take home, as well as book-lists for practice and inspiration. "How you plan on solving the design problem in front of you is the underlying logic, thinking, and reasoning." These are just a few reasons why Art is such a useful tool for learning and education. Not to mention, the many therapeutic qualities of creative expression. We hope you'll join us for Lessons in making art, we like to make each session really fun, engaging, and educational for both children and adults! Christine and Matthew Jennings plan and host several Nature Hikes each year that integrate exploration of local ecology with making art. We take groups of children and adults on trails to experience the beauty and wonder of our National Parks. We hope to inspire a new generation of artists and Naturalists! Bike through a forest. Walk in a desert. See a whale burst through the ocean's surface. Do all this and more with your pass. And bring a car full of family and friends for free! explore your creativity in an encouraging environment with step by step instruction, Ages 6 years old and up. Visit our Online Store to book an Art lesson, or contact us for more details.